All prices include a Full Welsh Breakfast. Kingsize Double Room. £80 for two people per night. Twin Bedded Room. £75 for two people per night. Double Room. £70 for two people per night. Single Room. £42.50 per night. For a third person in the Kingsize or Twin, add £25 per night. 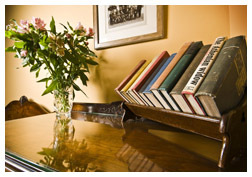 For Single Occupancy of the three larger rooms, deduct £15 per night. As we have our own cat, we regretfully inform you that we are unable to accommodate your pets. 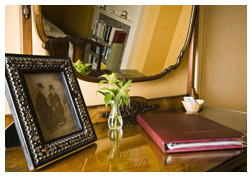 At busy times, especially weekends, we may ask for a two-night minimum stay.